While we provide built-in analytics for all of your pages and pop-ups, you can also use third-party analytics or tracking code. Tools like Google Analytics and Facebook’s Pixel provide powerful metrics so you can get even more data on your pages and forms’ performance. In this guide, you’ll also learn where you can paste third-party tracking code in sites, pages, or pop-ups, as well as edit search engine keywords and social media previews. Modifying your page or site’s code can cause issues on your pages or pop-ups. Take care to properly configure your tracking code according its documentation, and avoid entering other code in the tracking code sections. Each page, site, or pop-up has a set of global Tracking settings. You can access them in the builder’s left-hand sidebar, as shown below. If you're using the Standard Builder, you'll want to navigate to your Lead Page Options as indicated below. Before getting started, you’ll need to find out where your code should be installed. Check your tracking service’s documentation for their recommendation. Typically, they’ll suggest placing the code in the <head> or <body> section. You’ll also want to determine which destination to paste your code onto. Some services require you to paste their code on a “thank you” or confirmation page. Other tools might instruct you to install the code on your opt-in page itself. If you’re using a different service, visit their site to find out where they recommend pasting their tracking code. 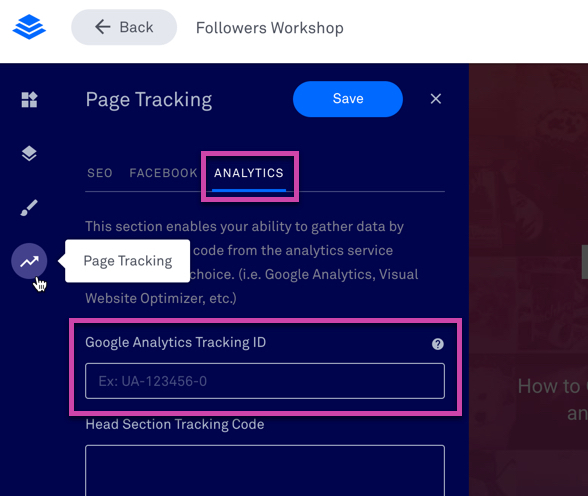 Within the Tracking section of the Leadpages builder, you can paste your Google Analytics Tracking ID (i.e. UA-123456-0). This is a quick and simple way to get your Google Analytics tracking code running on your page or site. NOTE: This field is currently for Google Analytics only. It's available in solely the Drag & Drop Builder. If you're using Google Tag Manager, you'll want to utilize the tracking code sections detailed below. Before following the steps below, you'll want to grab your Facebook Pixel code within the Facebook Ads Manager. We've got a couple of videos here to help you out! Create or open a Lead Page, site, or pop-up where you’d like to install your code. Click the Tracking tab in the left-hand sidebar, then select Analytics. Paste your tracking code in one of the fields provided, according to instructions from your analytics service provider. NOTE: Code pasted into the <body> section of a pop-up will always appear at the beginning of the <body> section. Open an existing Standard Lead Page, or create a new one. In the builder, click Lead Page Options in the left sidebar, then select Tracking Codes. Paste your code in the head or body section, then click Done. Click Save in the top-right corner. To add code to a form, follow the steps below. Open your form (which can be part of a Lead Page or a standalone Standard pop-up). Click Tracking Code in the left sidebar. Paste your code in either the “Extra head” or “Extra body” section, then click Okay. Click Okay again to save your form changes. Search engine optimization (SEO) is a complex topic, so we won’t cover all the details here. The good news is that a lot of best practices are built into Leadpages already—such as mobile responsiveness and structured HTML. For additional tips, check out Google’s Webmaster Guidelines. While you may not be able to implement every single best practice, their guide provides handy advice for optimizing your pages. Finally, you can set the title, keywords, and description of any page or site in the Tracking tab under the SEO tab. SEO settings are located in the Lead Page Options next to Tracking Codes in the Standard Builder, as indicated above. Do third-party analytics work with Leadpages published to WordPress or my server? Yes! As long as you include the code on your page or site, it should work with all of our publishing options, including WordPress. If you use our Advanced HTML export feature, it’s usually best to paste your tracking code right within your page or site’s source code (rather than in the builder). I need help setting up my tracking code… what are my options? As much as we’d like to help, we’re not able to provide direct support for third-party analytics platforms. That said, many top services have excellent guides that cover everything from setup to troubleshooting advice. That said, don’t hesitate to reach out to us if you have issues or questions about anything within Leadpages.